Yes, you’ve just got to have good beans. No pre-ground coffee allowed! You want fresh beans, ideally 3 or 4 days from being roasted. However, most of us normal folk will buy our beans in a bag. We’ll look for beans that have stayed away from oxygen, the enemy of all good beans. Nice beans will have a little oily shine to them, where old beans look dry and boring. Be sure to use equipment that doesn’t have leftover coffee oils from the day before. These oils go rancid quickly and give an off flavor to your brew. I recommend a burr grinder so that you can freshly grind your coffee. A medium grind is best for normal morning coffee, but be sure to buy a grinder that can make fine or course grounds, so that when you’re in the mood for a heavenly espresso at home, you’ll be set. Heat the water to between 190 and 200 degrees Fahrenheit. Don’t boil it. Neither should you use water that’s too cool. The Physics Factbook tells us, “If the temperature of the water is too low, underextraction will occur and the coffee will be too weak. Underextraction will cause the coffee to have a sour flavor, since the acids from the beans are the first substances to dissolve. If the brew water temperature is too high then over extraction will occur and the coffee will taste bitter.” We stick a thermometer in the neck of our tea pot and watch the temperature carefully for the best flavored coffee in these parts. Yes, I pour my water into my French press, stir the grounds with a wooden chopstick, then cover it. I set my kitchen timer for exactly four minutes and wait for magic to happen. If I didn’t wait long enough, my coffee would taste weak. However, in our busy house, I’m more likely to forget about it altogether, resulting in a bitter cup of joe. The timer protects the perfect coffee I’ve worked so hard to achieve. A percolator makes a great cup of coffee because it gets the temperature right and the timing issues as well. Commercial coffee pots are notorious for not getting the water to the correct temperature. An easy alternative in my house in the French press. There is no automatic timer, but I enjoy the morning routine of making coffee then sipping it as I check my email. It’s worth every bit of work (and it looks good, too)! Okay, my coffee’s going to get cold if I don’t drink it soon. I add fresh cream and sucanat to my clear, glass coffee mug and salivate as the beautiful layers of brown swirl and entice me. I stir it with a pretty, long-handled spoon. I sip… Mmmmm! Sounds inviting to drink…but I still can’t get past the bitterness. I’ll keep my tea! If I may add a coffee brewing method. It’s a method I like the most. It leaves the coffee smooth without bitterness. It’s called ‘cold press.’ There are cold press coffee makers, but the only equipment I’ve seen is plastic. I just put the coffee in a one gallon glass jar filled with water. Leave it in for 24 hours and filter the grounds out into another glass jar. It only takes a couple of tablespoons in a 6 oz cup and top off with HOT water. The coffee is super concentrated. Ps…. I’m posting off of my wife’s blog… just in case someone associated her face with my name. hahaha. FYI. I have a beard. Have you ever tried using an aeropress? 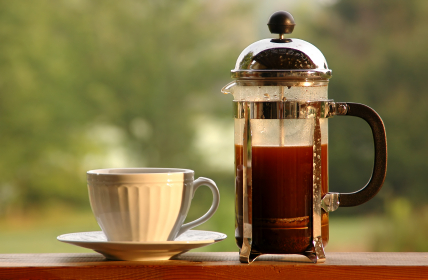 My husband LOVES coffee, and this is his preferred method, it’s faster than a french press, but without sacrificing flavor. I love it because the clean up is super simple. And for iced coffee, we just brew espresso directly over ice! Tiana, No, we have never tried this or even heard of it! Awesome… can’t wait to learn more. Easy clean up sounds *wonderful*…..
Hi Anne! Can you share which coffee beans you and your family enjoy? I try my best to stay away from SBUX, so any suggestions would be much appreciated. Thanks! Well, we actually use a local roaster, but we really like Darwin and his wife. They are dear friends, and they donate some from each bag to Micah’s Project, which is a home for boys on the street in Honduras.